…you shouldn’t walk your dog on that same sidewalk! During the last week of school, I walked my dog Maeby to the bus stop to meet my son’s school bus. Maeby kept holding her feet up, doing an awkward dance that I didn’t recognize. It was a warm, pleasant 80 degree day, and when I bent down to feel the asphalt on the road where we were standing, I almost burned my hand. No wonder Maeby was doing the “feet hurt” dance! Dog paws and dog paw pads are miraculous structures, cushioning and protecting Fido’s feet on every sort of terrain. However, hot asphalt and hot cement can burn Fido’s feet, just as they can burn ours. 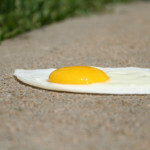 If you can fry an egg on the sidewalk (or if it’s too hot for your feet on the pavement), it’s too hot for Fido’s feet, too. This article from The Dodo shows what happened to a poor pooch on a hot summer walk.